Do others challenge your expanding portfolio or complicated offering? Need a portfolio pruning process or policy to keep a manageable inventory? Want to take the drama out of keeping or deleting products? Remember, SKU creep adds to the complexity, adds to inventory, and ultimately costs to deliver. Use this collaborative six-step process to shape up the portfolio. Download shipment history to Excel by item_location_customer for up to 36 months depending upon the business. Three years of history helps determine trends for a seasonal business and volatile businesses need focus on the current year. Remember, even if you ship directly to the customer, the basic data element to consider remains the item_location_customer. It forms the basis for aggregation to product families while providing the detail of customer shipments. Download forecast data in the same manner. This allows aggregation by a customer as well as product families. Depending upon your software, collect bias, forecast error, and graphs. Collect financial data from your local finance officer. You should ask for Cost of Goods Sold, meaningful price data, as well as inventory in dollars. Note: Price-COGS would be a rough estimator of revenue. 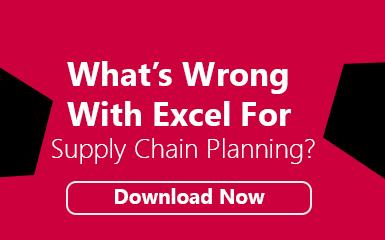 Note this is an Excel approach which involves manual data cumulation, using an integrated, advanced planning system will avoid the need for these manual steps. To give meaning to the review, apply relevant descriptive statistics alongside shipments and history. This provides fact-based grounding. Volume/Variability Matrix: Negotiate a ‘hurdle rate’, or threshold for monthly sales by product family and a COV ‘hurdle rate’ (typically 0.3 or 0.5). See Fig. 1 for an example. Document the replenishment type: Make to Stock, Make to Order, Re-Order Point, etc. Show stock out history (keep a record of weekly stock outs and calculate frequency: No. of stock outs/No. of weeks) If significant, for Quad I & II SKUs, seek remedies with Operations as you’re losing revenue. If the SKU ADI = 6, in Quad III, you might want to ask, why invest in a product that sells once every 6 months with high variability and low volume? Also, ask if you can convert the customer to another product OR ship out of a different warehouse (new SKU). If the product shows no shipments in the past 6 months, why keep it? However, if it’s a new product that is yet to launch, then document for next review. For SKUs in Quad II with high variability and high volume, consider collaborative planning with customers to lower variability. If the SKU crosses the line into BAD SKU territory, consider sourcing out of another warehouse to keep the item. Delete the item when all else fails. No matter how sophisticated your analytics, NEVER ignore Market Intelligence. When Sales wants to keep a product, challenge their concerns but be realistic. It’s their finished product inventory to sell and their inventory carrying costs. Just remember every SKU kept that does not sell adds to inventory and cost to hold. Your bespoke set of descriptive statistics (be prepared to customize the pivot table in front of Sales/Marketing …. this only adds to your credibility). Slice and dice by data element to capture multiple views. Consider new dashboards to keep SKU proliferation in check. Things happen and as you’ll soon find out from Market Intelligence (it’s not an oxymoron), you need to keep up with the changes to kill off the inventory of old product and quickly launch the new. 180 days may not fit your business, so consider what makes sense to you. Q. If all these steps, which is the most difficult? A. Step 3 by far. You need to create buy-in for this important process. Keeping old SKUs beyond their time adds to cost to deliver. Communicating product launches to planners and operations ensure success. Planning for both is good hygiene for the business.